Two calves whose genes have been edited so they won't grow horns are being raised and will later be bred at UC Davis, reported Edward Ortiz in the Sacramento Bee. Dairy cows have been bred for optimal dairy production, but the gene mix brought along horns. Angus beef were bred for optimal beef production, and don't have horns. Since the dairy industry doesn't want animals with horns because they can hurt each other or farmworkers, it is common practice to remove them shortly after birth. Removing the horns involves an uncomfortable procedure called debudding, in which, after being treated with a local anesthetic, the cells on the animal's head that would grow into horns are killed with an electrical appliance. 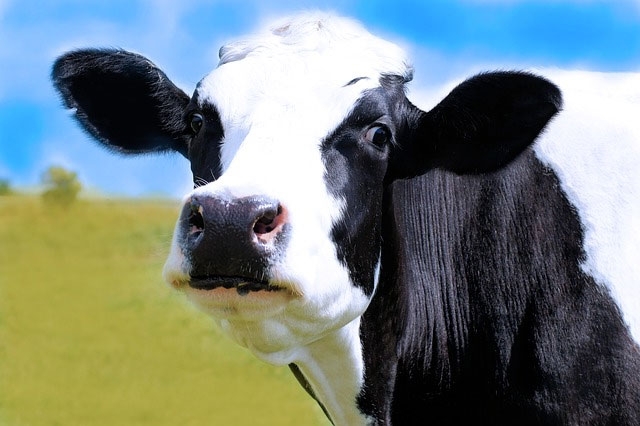 "Consumers are concerned about how we care for dairy animals. They expect us to do a good job and are concerned about pain and discomfort," said UC Davis veterinarian Terry Lehenbauer in a video about the advancement (See the video below). Using precision genetic "editing," scientists were able to delete the dairy cow gene that produced horns and replace it with the angus gene that resulted in hornlessness. At UC Davis, the two calves' growth and development will be tracked. Eventually they will father cows with horned mothers to see if the hornless trait is passed on to the offspring. The odds of them doing so, Van Eenennaam said, are 100 percent, if "Mendelian genetics hold true." Mendelian genetics are laws of gene inheritance discovered by 19th century monk Johann Mendel. Van Eenennaam said it's not clear whether other, unexpected effects of the gene editing will occur. However, if successful, gene editing will allow the dairy industry to bypass decades of breeding for hornless cows. Alfalfa is an important part of a lactating cow's diet. In two recent broadcast media stories, UC Agriculture and Natural Resources experts were able to provide accurate information about the water use on commodities that have been criticized for water consumption during the drought. The director of UC ANR's Agricultural Issues Center, Daniel Sumner, was one of three guests on the one-hour talk radio program Your Call, which was broadcast on KALW, Local Public Radio in San Francisco. The topic - How would reducing our intake of meat and dairy affect the drought? - was prompted by off-the-cuff comments made by Gov. Jerry Brown in June. Answering the question, "Is part of the drought strategy to reduce meat consumption?" Brown replied, "If you ask me, I think you should be eating veggie burgers." On the Your Call show, Sumner explained that beef consumption has little impact on the California drought. "I do want to make clear, when it comes to water embedded in any product, it depends where the water is from," Sumner said. "We feed cattle in California with grain from the Midwest." Dairy production is another issue. 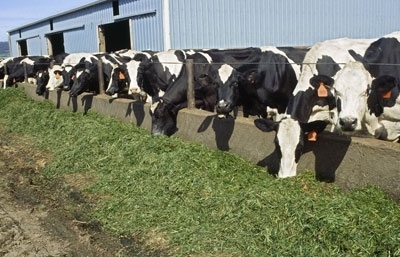 "Dairy cows are fed lots of grain, soybeans and canola coming from Canada and the Midwest, but also silage and alfalfa, much of which is from California. California dairy is a drought water issue. Beef really isn't." UC ANR Cooperative Extension specialist Dan Putnam appeared on the KTVU Evening News to discuss alfalfa water use with reporter Ken Wayne. Putnam said the drought has hurt the state's alfalfa industry. "Statewide, it's been fairly devastating," Putnam said. "We're at the lowest acreage we've seen probably since the 1930s." He also noted the importance of the crop, a key part of dairy cattle's diets. "An average field of alfalfa produces approximately 2,400 gallons of milk per acre," Putnam said. Mapping of the cow genome has provided scientists with information on the 3 billion base pairs on cattle DNA. Advances in cattle breeding over the past 60-plus years has reduced the carbon footprint of the dairy industry. DNA sequencing suggests still more productive cows and less pollution in the future, reported Lesley McClurg on Capital Public Radio. McClurg spoke to Alison Van Eenennaam, a UC Agriculture and Natural Resources Cooperative Extension specialist. Van Eenannaam is an animal geneticist based at UC Davis. "We used to have somewhere roundabouts 25 million dairy cows in the United States, and we're down to nine million now,” says Van Eenennaam. "It [has] actually reduced the environmental footprint of a glass of milk by two-thirds relative to the 1950's." Van Eenennaam is currently studying cattle genomics to understand the animals susceptibility to respiratory disease. Her research is funded by the USDA Agriculture and Food Research Initiative. Read more about the benefits of genomics to the dairy industry and the environment in the UC Green Blog. Tom Barcellos , a dairy forage production innovator, was featured in the LA Times. 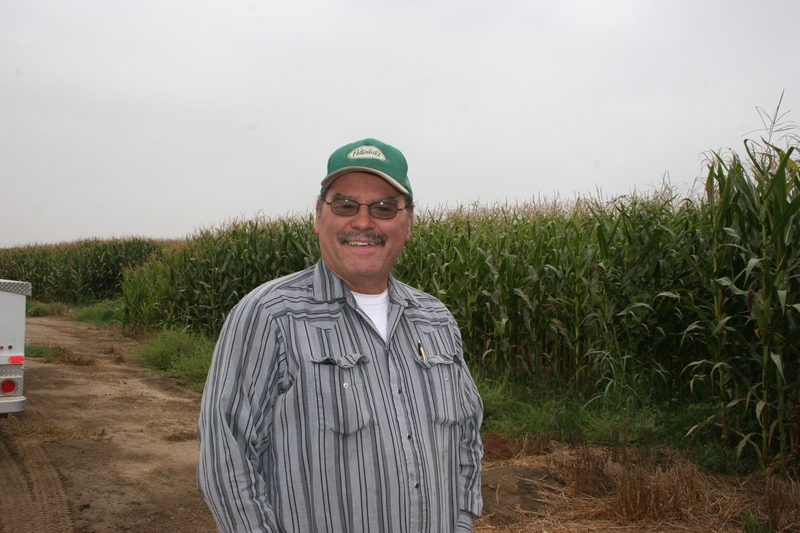 Dairy farmer Tom Barcellos, a longtime member of the UC Conservation Agriculture Systems Innovation workgroup, was featured in a Los Angeles Times story about the impact of the drought on the dairy industry. Barcellos said he fallowed 300 acres of farmland this summer and is buying feed from contractors in Nevada, Texas and as far away as Australia. "If we don't get rain or have a good winter, our farmers might leave the state," Barcellos said. Dairy products - milk, cream, butter and cheese - are by far the largest segment of California agricultural production, contributing $140 billion annually to the state's economy. But the the state's industry is shrinking. According to Lesley "Bees" Butler, UC Cooperative Extension specialist in the Department of Agricultural and Resource Economics at UC Davis, California has lost 1 to 2 percent of its dairy industry in the last three years. About 100 dairies go out of business every year waiting for rain. "It's a huge time of uncertainty," Butler said.